2013 NRA Annual Meeting and Exhibits for The New York Times — Portraits, Corporate Storytelling, and Reportage Photography based in Washington, D.C.
Billboards started popping up around Houston about a month or so ago proclaiming 9 acres of guns and related paraphernalia would be at the George R. Brown Center courtesy of the National Rifle Association's annual shindig. I contacted a few regular clients to see how they were set for coverage and I had a positive response from The New York Times for three days of coverage, Thursday through Saturday. It was an enchanting experience to say the least. Every kind of configuration of gun was to be had - big guns, little guns, short and long. There was also a litany of conservative speakers that required coverage for most of Friday touting the threat of gun seizure and a constant barrage of demonizing the media. The paradox, of course, is that they were more than happy and accommodating to have us there to cover their events and speakers. If they hate us so much, why invite us in the first place? I suppose a party just isn't festive unless someone brings the piñata. The coup de grace was during my coverage of the protest across the street. A man walked quickly past, took one look at my credential, pointed his finger at me and stated "You're the enemy!" I suppose in his eyes I was, even though he was more interested in name-calling than in actual dialogue. As I tried to engage him, he just kept double-timing it back to his car, evil media insulted, mission accomplished. Visitors stroll through the 2013 National Rifle Association Meeting and Exhibits May 3, 2013 in Houston. Kurt House, of San Antonio, TX, stands before his collection of factory engraved Colt pistols at the 2013 National Rifle Association Meeting and Exhibits May 2, 2013 in Houston. Factory engraved pistols are very rare and each one is worth about $50,000 by House's estimate. House is displaying his pistols with the Ohio Gun Collectors Association at the event. 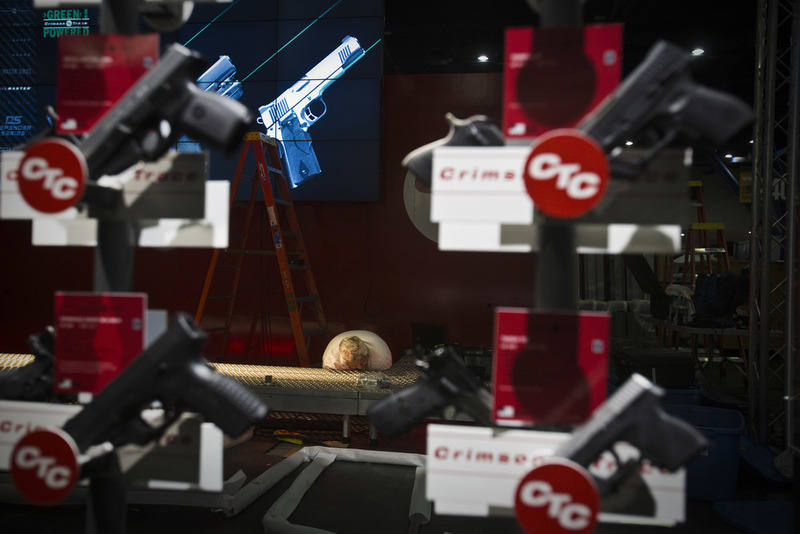 Attendees look at semi-automatic handguns at the 2013 National Rifle Association Meeting and Exhibits May 4, 2013 in Houston. Philip and Kitty Cox, of Memphis , TN, left, and John and Linda Kimble, of Denver, CO, practice handgun retention techniques during a workshop at the 2013 National Rifle Association Meeting and Exhibits May 4, 2013 in Houston. A worker helps set up the Crimson Trace booth at the 2013 National Rifle Association Meeting and Exhibits May 2, 2013 in Houston. Crimson Trace manufactures laser sights in both red and green. Attendees look at AR15 rifles at the 2013 National Rifle Association Meeting and Exhibits May 4, 2013 in Houston. NRA vice president Wayne LaPierre speaks during the NRA-ILA Leadership Forum at the 2013 National Rifle Association Meeting and Exhibits May 3, 2013 in Houston. A member of the audience waves the Gadsden flag during the NRA-ILA Leadership Forum at the 2013 National Rifle Association Meeting and Exhibits May 3, 2013 in Houston. David Goodrum, left, and brother Matt, look at SAR semi automatic home defense 12 gauge shotguns at the 2013 National Rifle Association Meeting and Exhibits May 4, 2013 in Houston. The audience listens during the NRA-ILA Leadership Forum at the 2013 National Rifle Association Meeting and Exhibits May 3, 2013 in Houston. Jerry Wehner, of Rising Sun, IN, waits for the beginning of the annual meeting of members at the 2013 National Rifle Association Meeting and Exhibits May 4, 2013 in Houston. Jackie Love, with Winchester Repeating Arms, threads a security cable through over/under shotguns at the 2013 National Rifle Association Meeting and Exhibits May 2, 2013 in Houston. Vianne Euresti, left, and Jack Dougherty, of Tactical Rifles, looks down the sight of a M-4 at the 2013 National Rifle Association Meeting and Exhibits May 3, 2013 in Houston. Former Alaska Governor Sarah Palin speaks during the NRA-ILA Leadership Forum at the 2013 National Rifle Association Meeting and Exhibits May 3, 2013 in Houston. Visitors check out the Wall of Guns, where visitors can purchase a chance to win a firearm at the 2013 National Rifle Association Meeting and Exhibits May 3, 2013 in Houston. Volunteers sight air rifles at the Pyramyd Air air gun indoor shooting range at the 2013 National Rifle Association Meeting and Exhibits May 2, 2013 in Houston. Instructors were available for those willing to pay the $1.00 fee for five shots. A poster of Charlton Heston, along with other celebrity members, hangs in the George R. Brown Center at the 2013 National Rifle Association Meeting and Exhibits May 2, 2013 in Houston.